The hydrologists! Sinéad Duffy, Stephen Carey, Eoin Sherlock and Ciarán Broderick (Quiz runners-up). 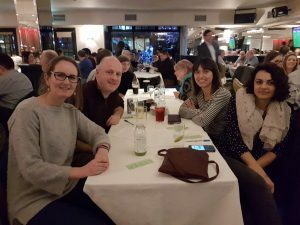 The Irish Meteorological Society organises a quiz each January as the main fundraiser for events that the Society holds throughout the year. 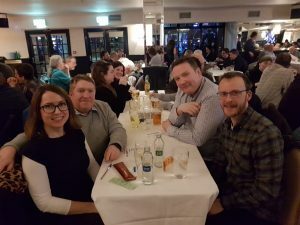 It is always very popular, not only with meteorologists and members of the Irish Meteorological Society, but also with members of the public who enjoy a good general knowledge table quiz. This year, three members of the EMS Liaison committee (Emily Gleeson, Sinéad Duffy and Laura Zubiate) went along to what was an extremely enjoyable event. 24 teams battled it out over the course of a few hours. Evelyn Cusack and Gerry Murphy (both IMS committee members) were quizmasters for the night. 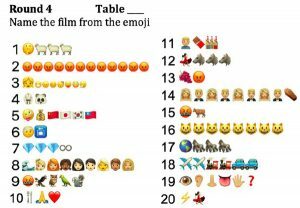 There were 5 general knowledge rounds and 3 picture rounds, including one on determining film titles from emojis, giving a total of about 90 questions. The questions were supplied by Seán Venn of the IMS committee. The Snow Flowers: Emily Gleeson, Tomas Townsend, Laura Zubiate and Anca Turcu. Some sample questions from the night to test yourself! Mars and Murrie are the founders of what? Who beat Ireland in the 2018 Hockey World Cup final? If cats are feline and dogs are canine, what are bears? The Intertropical Convergence Zone is affectionately known as what? If it’s noon in Ireland and you are facing a rainbow, are you facing N, S, E or W? How many varieties are there in a tin of Quality Street chocolates? If your Society is thinking about holding a fun event or an event to fundraise for the Society, why not consider holding a Table Quiz?! Test yourself on this emoji film round! (credit: Seán Venn, IMS).